With the capability of continuously shredding 550 sheets automatically and 14 sheets manually at a speed of 11 ft. /min, the AutoMax 550C auto feed cross cut shredder completes shredding jobs more efficiently than you can expect. It can not only shred staples, credit cards, paper clips, CDs/DVDs, junk mail at a particle size of 5/32” x 1 1/2” but can store 83 gallons of waste in the removable pull-out cabinet installed within. Using the Fellowes shredder bags you can maintain a tidy work environment. Amazing right! The auto reverse feature stops the AutoMax 550C cross cut shredder from paper jams that actually contributes in faster operations than usual. While the automatic feed shreds paper without you standing besides it, making shredding tasks hassle and hands free. For instant shredding of small stacks of paper, staples, credit cards, paper clips, CDs/DVDs, junk mail, the AutoMax 550C auto feed cross cut shredder encompasses a manual feed slot. AutoMax 550C auto feed cross cut shredder makes sure that the machine is secure and that is why it offers SmartLock™ feature that enables the user to lock the machine by simply feeding a 4 digit code. Therefore the Fellowes 550C auto feed cross cut shredder is the best shredder for office environment as it offers the user automatic interruption free shredding. Q. Can I use the AutoMax 550c in a big office? A. Certainly. The AutoMax 550c is designed for heavy use and is perfect for medium to large offices. A. 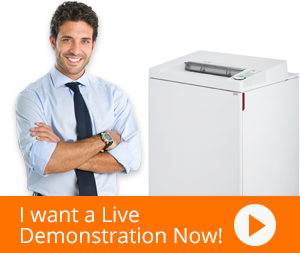 The AutoMax 500c shredder can process 550 sheets of paper in 11 feet per minute. A. The AutoMax 550c has a continuous cycle time. It can run without any rest. Q. How loud is the AutoMax 550c? A. The SilentShred feature makes the AutoMax 550c extremely quiet and not noisy at all. Q. Can the AutoMax 550c shred only paper? A. Yes, the AutoMax 550c comes with a 2-year warranty on the machine.